Alice Alena McDaniel, 45, Phillips, died at her home in Phillips on Monday, March 25, while under the care of her mother and Flambeau Home Health and Hospice. She was born in St. Paul, MN, on April 26, 1973, the daughter of James and Regina (Holoubek) McDaniel. She was a 1995 graduate of the Palm Springs High School of Palm Springs, CA. She was employed by Walmart in Stafford, VA, and in the fast food industry prior to moving to Phillips, and while in Phillips was employed by the Red Apple Center in Phillps. At the age of 7 she was the Princess of the 1980 Special Olympics in Utah. In 1999 she represented Utah for Golf in the Special Olympics held in Florida. She was baptized and a member of the Church of Jesus Christ of Latter-day Saints. She participated in the Special Olympics for 35 years and in her free time enjoyed looming hats. She is survived by her mother, Regina Holoubek, Phillips, by her father, James (Georgia) McDaniel, Tahlequah, OK; by three siblings, Howard McDaniel, Phillips, Richard (Lindsy) Peterson, UT, and Jerri Cross, VA; by multiple step brothers and sisters; by six nieces and nephews that she loved dearly, Tammy, Austin, Breanna, Blayden, Kellie, and Jaxon; and by numerous aunts and uncles. Funeral services will be held at 2:30 P.M. on Saturday, March 30, at the Heindl Funeral Home in Phillips with Brother Tom Jones of the Church of Jesus Christ of Latter=-day Saints officiating. Interment will be in the Saint Patrick Cemetery in Phillips. Friends may call at the funeral home on Saturday from 1:30 P.M. until the time of services. 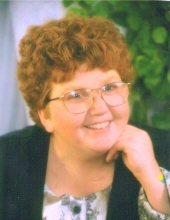 To plant a tree in memory of Alice Alena McDaniel, please visit our Tribute Store. "Email Address" would like to share the life celebration of Alice Alena McDaniel. Click on the "link" to go to share a favorite memory or leave a condolence message for the family.